On the fringes of Lisbon, in the picturesque section of Belém, are two shrines that every year draw hundreds of thousands of pilgrims. The more imposing is the Mosteiro dos Jerónimos, the Manueline-style monastery that contains the tombs of venerated kings and queens, Vasco da Gama, and the national poet, Luís de Camões. 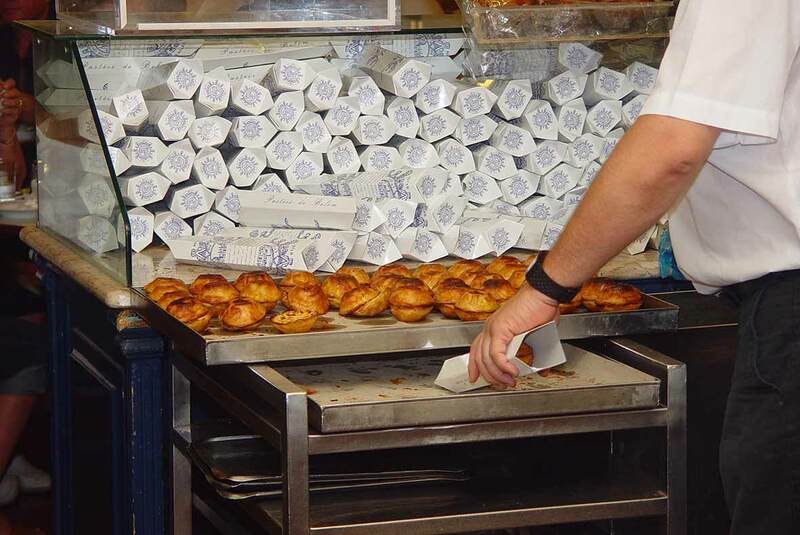 Nearby is a pastry shop called the Antiga Confeitaria de Belém, home to what is arguably the Holy Grail of Portuguese sweets: pastéis de Belém, the recipe for which has been a secret for centuries. Having been raised in a Portuguese-Catholic family, I looked at the monastery, then at the confeitaria, and joined my fellow sinners in the happier-looking line in front of the shop. This adoration of the pastéis is easy to understand after you’ve taken a bite. The confection’s shell is made from massa folhada, Portugal’s equivalent to France’s puff pastry. It spirals up, creating a nest of hundreds of crisp layers. Inside is a luscious, warm custard. Rarely do a dozen make it home intact. I was bucking to become the fourth. Security is tight at Antigua Confeitaria. Master bakers make the custard and dough in a locked room, and not even the women who sit a few feet away tucking spirals of dough into small, flared baking tins know what goes on in that room. As I circled through the kitchen taking pages of mental notes, I backed up to the barred door and gently rattled it. “Nice try,” said Maria Dulce Roque, the confeitaria’s publicist. It’s partly this mystery that keeps the confeitaria’s dining rooms filled. Scattered among the prim families who visit every Sunday at teatime and the dusty workers who huddle together knocking back piles of pastéis and demitasses of strong Portuguese coffee at lunch are the sleuths. Primarily tourists, these pastéis lovers are determined to crack the ancient code, an activity Lisboetas gave up long ago. With pens poised, they bite off a tiny piece, confer, and write. And so it goes, picking, nibbling, conferring, and writing— yet according to Roque there have been no dead ringers as a result. 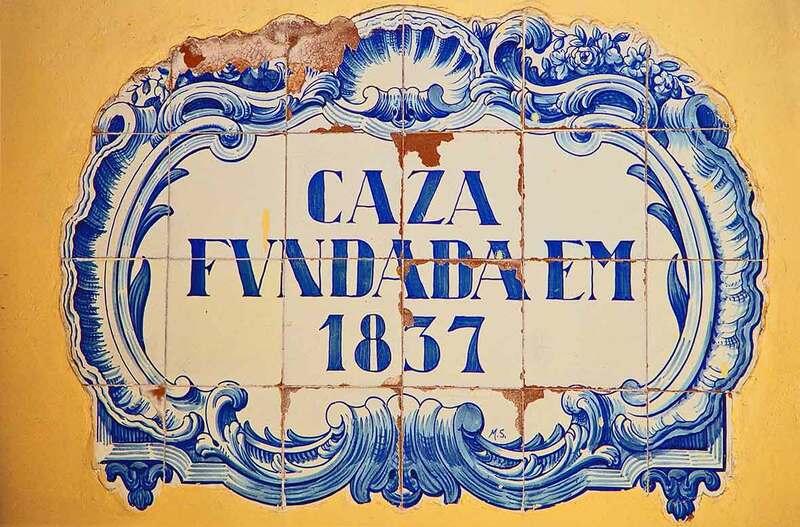 Still, the Clarinha’s family registered the name in 1911 to assure that only pastries that come out their ovens can be called pastéis de Belém. Generic, and often anemic, imitations can be had elsewhere under the name pastéis de nata, custard pastries. Although he’s cagey when it comes to the recipe, Clarinha did let a few preparation secrets slip. “We rest the custard and dough in the refrigerator overnight, and we bake the pastéis for 30 minutes at 400 degrees,” he told me. Then almost as an afterthought he added, “Celsius.” My eyes widened. That’s about 750 degrees Fahrenheit! Granted, a very hot oven is required to create the characteristic mottled brown top, but that’s incinerator hot. Back home I called Shirley Corriher, the doyenne of food science and author of the book Cookwise, to find out if something not much bigger than a Dunkin’ Donuts Munchkin could survive that heat. “Maybe that’s how they keep the secret recipe secret,” she said laughing. It is a foolproof strategy: Discourage nosy writers and curious cooks from ever attempting to duplicate the pastries by throwing them off the scent with impossibly high temperatures. Stymied in Belém, I turned to Alfama, the upscale Portuguese restaurant in New York’s West Village. There, chef Francisco Rosa, who studied at the Escola de Hotelaria e Turismo de Coimbra north of Lisbon, makes what many Portuguese expats maintain is the next best thing to the original. 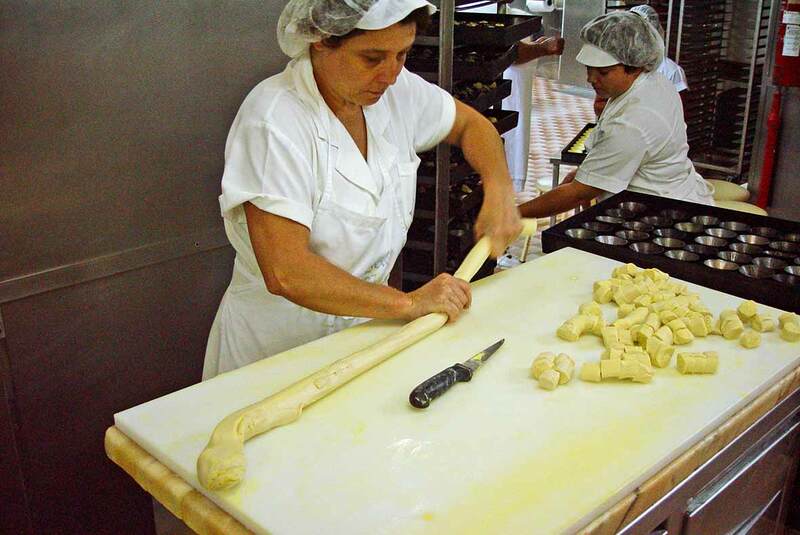 “A lot of customers prefer ours,” Rosa told me as we rolled out huge sheets of dough. Unlike Clarinha, who has a dynasty to protect, Rosa was happy to share his take on the popular pastry. “They say they even taste great the next day.” I tried to test his hypothesis, but the longest I could hold out was 30 minutes — proof enough for me that his pastéis are fraternal twins of the Belém version. Although of slight build and modest height, Rosa turned out 200 perfect pastéis in just under an hour. “Do you think you can do it?” he asked, moving on to prepping sardines. It took a second trip to Alfama, three phone calls, and seven attempts at home before I could adapt Rosa’s adaptation of the enigmatic pastéis for the home cook. To celebrate, I gathered a few friends, some of whom had been to Belém with me. I served the pastéis slightly warm, sprinkled with a blanket of powdered sugar and a tap of cinnamon, just as they do at the confeitaria. The consensus was six thumbs up. However, I knew that until I could wiggle my way into that secret room and answer the burning question of the 750-degree ovens, my quest would continue. Hi, Carlos. No I didn’t know of the research but I’ll try to find it. And I think EVERYONE would like the original recipe! Two things I know are crucial: a very hot oven and consuming them while still warm. 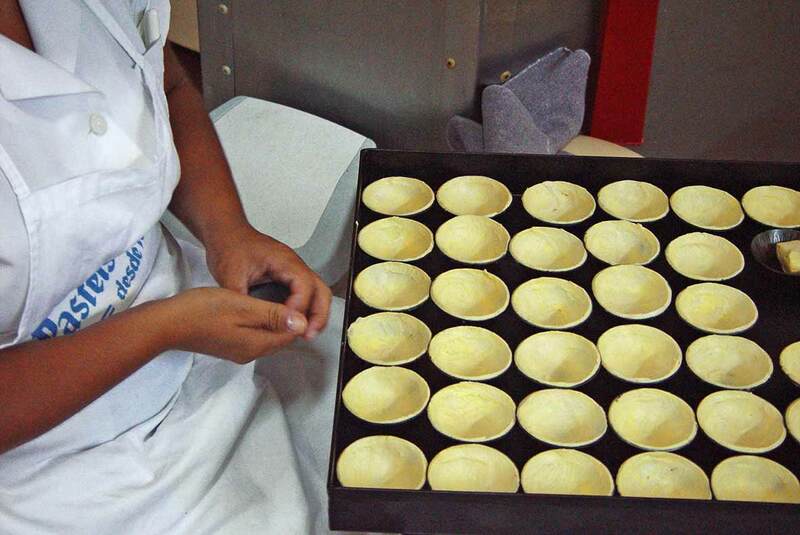 Business is always at a fever pitch at the confeitaría, that the stash of pastéis never has a chance to get cold, as they do in other places, such as A Brasileira or Nicola. Hi David. How can you in your position as someone who should know better perpetuate the error of referring to pastéis de nata as “custard”? It obviously goes to show that you know nothing! Hi Rui, thanks for writing. What do you think is a better term than “custard cups”? Below are several definitions of a custard, which I think apply in all cases. The only difference is the filling of the pastéis is stabled before heating in a hot oven. My apologies for my earlier email. It is just that I really get annoyed when people misrepresent and subsequently bastardise products with hundreds of years of history. Pizza in the United States is a case in point. Your blog speaks to the masses, not people with knowledge of gastronomical/culinary terminology. When you say “custard”, 9/10 imagine corn-starch yellow powder and subsenquently a lot of people will make “custard tarts” with corn starch and call them “pastéis de bata.” It has happened to me and I am sure that on your travels you probably have come across such “pastéis de nata”. So let’s call a spade a spade. To quote further from where you quoted on the Wikipedia, “Custard tarts have long been a favourite pastry in Britain and the Commonwealth. They are often called egg custard tarts or simply egg custards to distinguish the egg-based filling from the commonly served cornflour-based custards.” If there is no name for it, then let’s leave it as is–we do go around translating “baguette.” “croissant.” “chouriço,” “chorizo,” prosciutto, etc. To call “chouriço,” “chorizo,” a “pork sausage,” or “prosciutto” “ham” is just not the same. No apologies necessary, Rui. I figured that’s where you were coming from. I agree you don’t need to say “flaky French crescent roll” when you mean “croissant,” because “croissant” has fallen is part of the American lexicon. My hope is through my work, and the work of others who write about Portuguese food, the need for appositives will go away when the food is familiar enough to the public. If you have a better, more clearly define English term I can use other than “Portuguese custard cups,” I’d like to know. Thanks for posting this. I’ve become obsessed with making my own pasteis de nata. Hope to see a review of other pasteis de nata shops in Portugal too. The only thing we get over here in Malaysia that’s close is natas from Nando’s. You’re more than welcome, Nicholas. As an avid fan for years of these delights, I was surprised to read that the pastry contains ‘a touch of pork fat’. It was a chef named Nuno Mendes who recently posted this on the Visit Portugal Facebook page, can you confirm this – I have a few vegetarian friends who I’m sure would be keen to know! Sarah, there are as many variations of this as there are cooks. 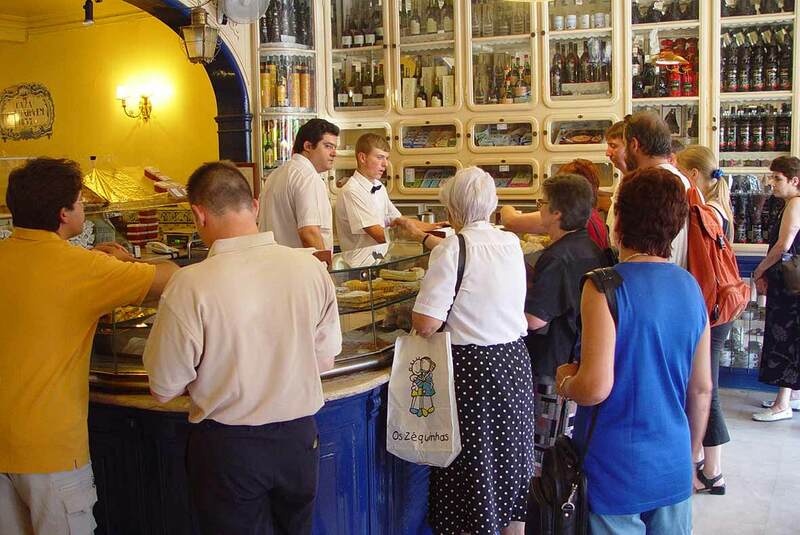 I don’t know what the original recipe calls for–no one knows, except the folks at the Confeitaria de Belém. You can certainly make these without lard.